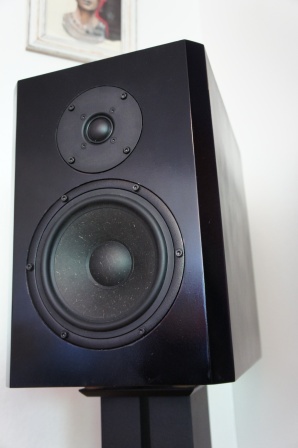 I have written a small review on the Zaph Audio ZA-SR71 loudspeaker design. The ZA-SR71 is a popular and a well-regarded design among the DIY community and rightfully so. The ZA-SR71 is both technically well-designed and a good performer sonically, paired with a high performance/price ratio. I have personally built and used the ZA-SR71 for some years now and I listen to them from time to time and I still enjoy them. I’ve used the ZA-SR71 as a sort of DIY reference loudspeaker and sometimes used it to benchmark other loudspeaker designs against. I’ve made a small modification to the original ZA-SR71 regarding the enclosure volume. I found the 14 liter enclosure way too small for the Seas ER18RNX mid-woofer and I increased the volume to 18 liters. Besides that, I’ve used exactly the same cross-over and the same cross-over components sold by Madisound in the ZA-SR71 loudspeaker kit. In my review I’ve measured the driver units individually and the measurements includes, T-S parameters, distortion, impedance and frequency measurements as well as measurements for the finished design. Please visit Zaph Audio website for the full ZA-SR71 design documentation regarding cross-over schematics, tuning options and the designer’s comments to the ZA-SR71. I’ve also made some cross-over simulation based on my own measurements to show some effect of changing the listening distance to the loudspeaker as well as showing the driver units cross-over slopes and phase behavior etc. 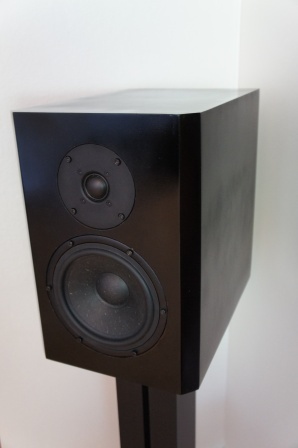 I think John Krutke (Zaph Audio) made a very nice DIY loudspeaker design with the ZA-SR71 and I just want to say that this review is my personal opinion and is based on my own sound preferences, measurements and design views and shouldn’t be consider as criticism to another loudspeaker designers design choices. Read full article |Comments Off on Zaph Audio ZA-SR71 Review! 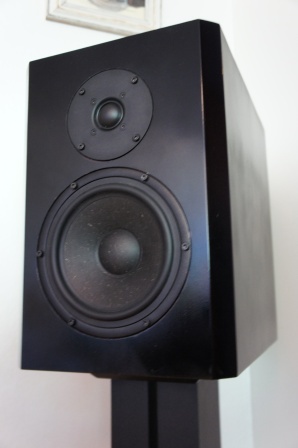 I’ve published new driver unit measurements for the upcoming review of the famous Zaph Audio ZA-SR71 DIY loudspeaker. Sequence Two – Monitor BE Released! Basically it’s the same design, but with minor tweaks to the cross-over. 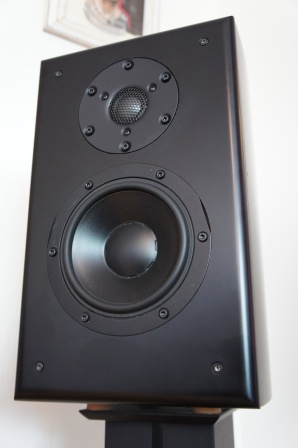 The ScanSpeak “Beryllium” and the “Textile” AirCirc dome tweeter is essentially the same driver and can be regarded as drop-in replacements for each other. Sonically the “Beryllium” version has greater transparency, reveals additional micro-details and is a bit more analytic in its character compared to the “Textile” soft dome version. ScanSpeak Textile Dome vs Beryllium Dome! Read full article |Comments Off on Sequence Two – Monitor BE Released! What are the similarities and differences the between the ScanSpeak D3004/660000 1” Textile dome versus the D3004/664000 1” Beryllium dome, besides the price tag? Left: The ScanSpeak D3004/660000 1” Textile dome. 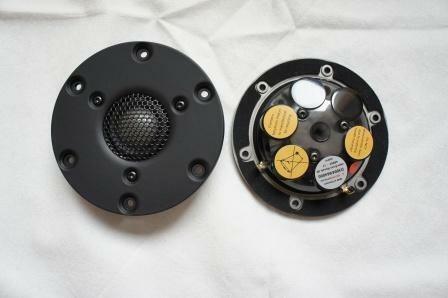 Right: The ScanSpeak D3004/664000 1” Beryllium dome. Blue = The ScanSpeak D3004/664000 1” Beryllium dome. Green = The ScanSpeak D3004/660000 1” Textile dome. Red = The ScanSpeak D3004/664000 1” Beryllium dome. Blue = The ScanSpeak D3004/660000 1” Textile dome. The frequency dip at 3.5kHz is caused by baffle diffraction and is evened out with increased off-axis angle. They have the same die-cast rubber painted aluminium faceplate. They appear to share the same AirCirc motor system with 6 Neodymium magnet slugs. They have the same resonance frequency and DC resistance. They have almost the same frequency response up to 13kHz. They have the same frequency level at 30kHz. The D3004/664000 tweeter dome diaphragm is made of 99% Beryllium, versus the D3004/660000 is made of a Textile dome diaphragm. 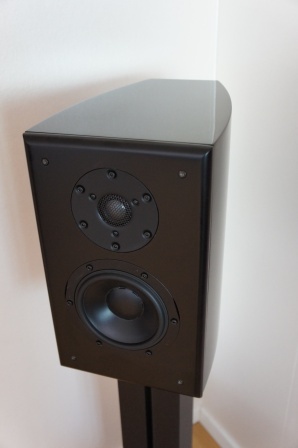 The Beryllium tweeter costs roughly 2 ½ times more than the Textile tweeter. The Beryllium tweeter has about 0.5dB lower sensitivity and slightly higher impedance than the Textile tweeter. The Beryllium tweeter has a sharper and higher impedance peak at the driver resonance frequency. The Beryllium tweeter has a small frequency dip centered at 8.5kHz that might be caused by the metal protective grill. The Beryllium tweeter has a downwards sloping frequency response from 13kHz. The Textile dome tweeter has an upwards rising frequency response from 13kHz. 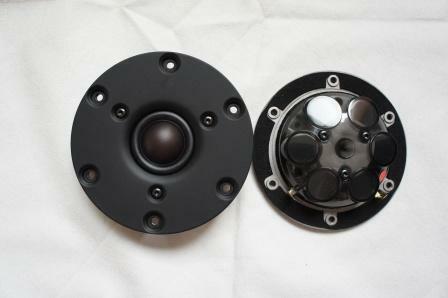 The Textile dome tweeter has about 7dB higher output at 20kHz. The Beryllium tweeter has lower distortion throughout the driver unit usable frequency range, compared to the Textile tweeter. Beryllium is highly toxic and should be handled with care if it breaks. Basically YES, but minor adjustments might be required for perfection. 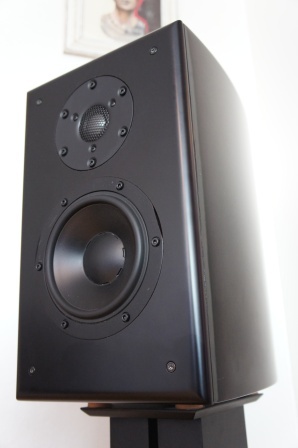 The Beryllium tweeter has slightly better distortion figures otherwise they both have “top notch” performance. My personal opinion is that the Textile dome has better price/performance ratio, due to significant lower cost. NO, in my opinion they don’t sound the same. The Beryllium tweeter sound to my ears a bit more neutral in the character than the Textile dome tweeter, which in turn has a bit more “airy” character. I know that it’s a vague description, but they both share the same qualities and the differences aren’t huge. At this point I can’t really say which one that sounds the best. I would say it’s more of a personal taste, metal versus soft dome tweeter. I personally isn’t a huge fan of hard dome tweeters, but the ScanSpeak Beryllium dome tweeter is definitely the best one I’ve so far have listened to. The Beryllium tweeter is a bit more analytic in its character than the Textile dome, which in turn is a bit more forgiving sounding on the less good recorded albums. This might change over time because the Beryllium tweeter seems to need some significant time to burn-in, compared to the Textile tweeter. Out of the box the Beryllium doesn’t sound impressive at all, but after about 24 hours they start to loosen up and deliver nice performance and my guess is that they over time will continue to improve. Both these tweeters are world-class performers. If you want the “top of the line”, something exotic and isn’t cost-sensitive, go for the Beryllium. If you don’t like hard domes or have a limited budget, go for the Textile version. Read full article |Comments Off on ScanSpeak Textile Dome vs Beryllium Dome! 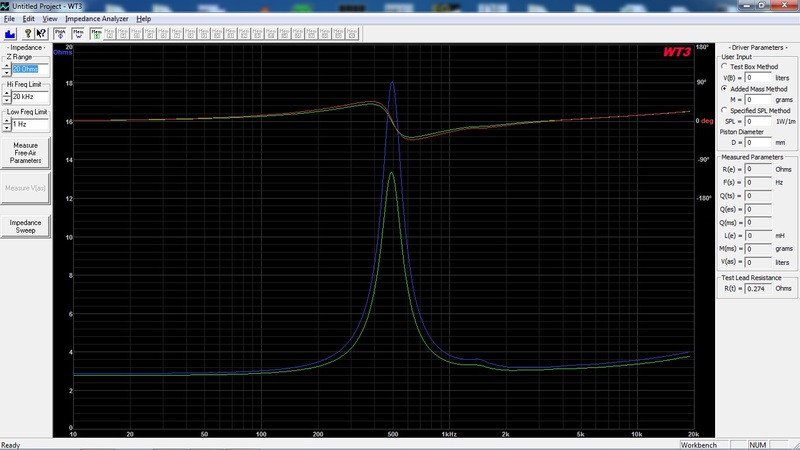 This time I’ve measured the ScanSpeak “top of the line” D3004/664000 tweeter, which uses a 1” dome made of 99% Beryllium. This is an exotic and very expensive tweeter, but it’s also one of the best measuring dome tweeters I’ve had on my workbench.